"When I had overruled ADM Jabalpur, I was sure that it had to be overruled. I hadn't the slightest doubt in my mind and I always felt that it had to be overruled having gathered the knowledge of law over the years. It wasn't difficult in that sense. But yes, there was, of course, a little bit of the personal element involved and I was conscious of the fact that I was overruling my father's judgment, which I again did eventually, in the adultery judgment". Dr. Justice D.Y. 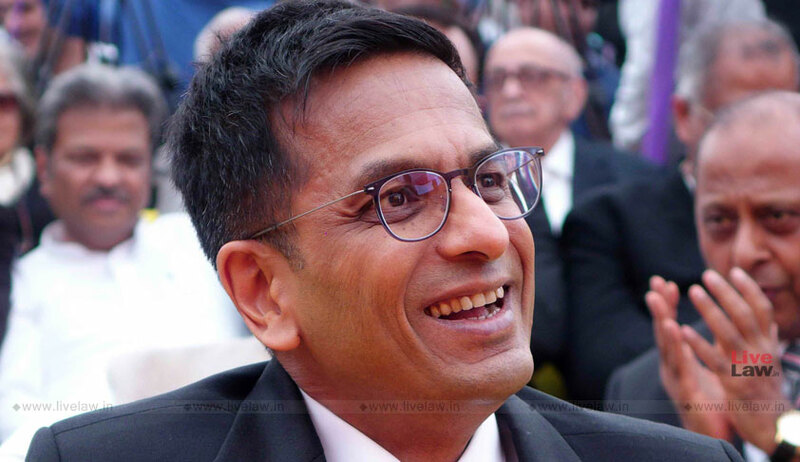 Chandrachud is a sitting judge of the Supreme Court of India. A graduate of St. Stephen's College, Delhi University and Harvard University where he went on to earn his Doctorate of Juridical Sciences as an Inlaks Scholar, Justice Chandrachud is widely known for his judgments, his broad range of knowledge as a jurist and philosopher and as a citizen of the country who has ushered in significant change in the country over the past two years, with his judgments. In this interview with Swagat Baruah, he discusses his idea of good judges, his influences, his vision of the future legal regime, his idea of free speech and also his favourite cricketers and musicians. Swagat Baruah: Do you think it's possible for judges to be apolitical? Should they be apolitical? D.Y. Chandrachud J: To speak specifically of India, else we'd have to cover a broad canvas, our legal system follows the common law tradition. Across the spectrum of the judiciary, judges are selected from the bar or from the bench itself for higher office. The manner in which our selection plays, from the district level to the Supreme Court is indicative of the fact that we are all essentially senior judges or people who have been brought in from the bar after much experience. The kind of training that goes into a person appointed to judicial office is essentially training of a protected nature, which I believe is significant. But our profession is such that we essentially construe ourselves as members of the legal group who are called upon to resolve legal disputes, be it civil, criminal or constitutional. But if you look at some other country, such as the United States of America it is not necessarily conditioned by the fact that to hold judicial office you have to be a piece of the state. People from a wide spectrum of public and political life come into the Supreme Court. But once you occupy office, there is a certain internal discipline of the profession which the people must follow, which is the requirement of vigorous legal analysis, the application of legal principles, the need to ensure certainty and the adherence to dictum. So many of these features of our work necessarily condition our duties as judges. Having said that, I also understand that there are cases in front of us, both before the High Courts and the Supreme Court of our country, which have political undertones. Now here one must note that we don't apply the doctrine of judicial review of political questions which the American Supreme Court does, which means that they won't rule on political questions. Our Supreme Court has said that even if a case does have political undertone, that doesn't mean it can't decide the controversy. For instance, in cases involving Article 356 of the Indian Constitution, the court was required to apply a constitutional standard. Hence, in deciding a case of a political nature, the court does and must try to apply constitutional standards because so long as the judges apply constitutional standards, they attain the basic expectation of being apolitical. Even if they are deciding political disputes, they must meet these certain legal standards. That is the surest guarantee that judges can have while deciding political issues – the adherence to certain legal standards and principles. S.B: Leaving political affiliations or inclinations of judges aside, wouldn't you agree that judges can nonetheless be not void of ideological leanings? D.Y.C J: There would be judges who will obviously be more liberal than others. There would be judges who would be more conservative than others. There would be judges who would have a certain philosophy in terms of their own experience of life, in what they have seen of injustices as citizens, as lawyers and judges. So we are constantly being shaped by our experiences of life. But the surest guarantee to maintain your own credibility as a judge is to not get enmeshed in any political ideologies because that is something I believe, very distinct from your work as a judge. And your training as a judge enables you to do that. Which is not to say that judges don't have philosophies or that they don't have a particular view on public issues. That's personal to the judge as it is personal to every human being. But in the work that you do, you have to ensure that you keep all of this as aloof from your decision-making process by applying clear cut legal standards and constitutional principles. S.B: You've always called for a transformative society, a transformative constitution, a transformative law which espouses liberal values. With the 377 judgment and the Sabarimala judgment, you have propagated the idea of constitutional morality, because you believe that the Constitution when it can, it must change things for better. Which philosophers/thinkers, lawyers or judges have been pivotal in shaping your thought process? D.Y.C J: What really has always guided me are the values of the Constitution itself. Our Constitution, to my mind, espouses diversity, plurality and liberalism, which is the heart and soul of the Constitution. The Constitution obviously has to help in the social transformation of various structures of our society. If you ask me who has inspired my thinking with regard to the Constitution, it would be Dr. B.R. Ambedkar and the founding parents of the Constitution, people like Alladi Krishnaswamy Ayyar. These were very distinguished people who laid down the path for the future. As for judges who have deeply inspired my understanding of the Constitution, it would be Justice Subba Rao who I enormously respect for his vision and learning for the future. Apart from Justice Subba Rao, there is Justice Vivian Bose, Justice Hidayatullah – judges who wrote well and judges who had the ability to communicate their views well and were not fearful of the fact that their views would lay down the guidance for the future. S.B: I'm surprised you haven't mentioned your father, the late former Chief Justice Y.V. Chandrachud. D.Y.C J: I thought I shouldn't mention something personal. How can I not mention my father? But he's my father, so I thought I should mention some other people. S.B: Did you discuss the ADM Jabalpur judgment with him when it had come out? How did you feel when you overruled your father's judgment in the same, in the Right to Privacy case? D.Y.C J: When the ADM Jabalpur judgment came out, I was not even a student of the law. I had passed high school in November of 1975. The emergency was declared in June 1975 and I was in the last days of my high school then and I don't think I had the ability to deal with the nuances of the Constitution. But as the emergency progressed, we all had very strong views regarding it. I was studying in St. Stephen's College, Delhi University which was the centre of the resistance to the emergency. We had a whole lot of extraordinarily fearless and dynamic student leaders because St. Stephen's and Delhi University itself was very liberal. A lot of the thinkers who influenced me then were people on the left or the liberal side of the spectrum. I read through 3 years of the economics course and I think that was a very formative stage of life when there was so much change taking place elsewhere in the world and how economics and politics was reshaping democratic societies in the world. Incidentally, we heard a lot about the Iron Curtain countries as well and we had a clear picture of what happens when countries block information from their citizens because we dealt with a lot of economic literature coming in from the then Soviet Union. When I had overruled ADM Jabalpur, I was sure that it had to be overruled. I hadn't the slightest doubt in my mind and I always felt that it had to be overruled having gathered the knowledge of law over the years. It wasn't difficult in that sense. But yes, there was, of course, a little bit of the personal element involved and I was conscious of the fact that I was overruling my father's judgment, which I again did eventually, in the adultery judgment. In fact, while overruling the Sowmithri Vishnu case in the recent adultery judgment, one of my colleagues told me jokingly that, "be careful, it's a very carefully reasoned judgment", to which I replied that yes it is carefully reasoned, but is also clearly wrong. As per legal formalism, there was no reason to follow a wrong judgment. So as a judge, I had no difficulty at all while overruling the judgments. The fact that those were my father's judgments were mere co-incidences for me. And there also other parties to the ADM Jabalpur judgment apart from my father as you may know. Justice Bhagwati was also part of the bench which decided the ADM Jabalpur judgment. So that is never really an issue. Ultimately we all realise that as judges, nothing is personal to us, whether you're overruling the view of some other judge or of the view of somebody who may be related to you, somebody who may be close to you. Just as in during our time in the High Court, we hold no objection to the Supreme Court overruling our views, because we can't. You're overruled not because you're wrong but because there exists a higher court. The Supreme Court is final not because it is right, but it is right because it is final. So long as we understand that we are given that ability by the Constitution today to define it and that it calls for an introspection of the fact that times change and society changes and that possibly many of our views might come up for reconsideration in a distant or a not too distant future, we respect the part of the process. It is a reminder to us that we are not invincible as judges and that we are only humans and that as society changes, so must our views. S.B: Your judgments have always called for love, for peace and for compassion. How have you inculcated such a culture of love and culture having been in a profession where we must not let our emotions override our judgment and decision-making process, sometimes even at the risk of cold-heartedness? How do you think lawyers must think? D.Y.C J: I think one of the things I've taken as a learning experience over the years is that in order to be compassionate, it is important not to be judgemental. Perhaps what happens to lawyers is that by virtue of the nature of the profession one tends to become judgemental. Lawyers shouldn't be judgemental because you are appearing for all kinds of clients, for all ends of the spectrum – the black, the white, the liberal, the conservative, the centrist. The important thing, I feel, is not to be judgemental. When you consciously make an effort not to be judgemental, you grant space to others and I think that granting of space to others to live their lives is crucial to a free society. To understand that people who have views which may not be in sync with yours, people whose views don't agree with the mainstream are yet entitled to lead their life on a platform of equality and I think equality itself is full of compassion. S.B: What kind of a free speech regime do you envision for a society? D.Y.C J: Firstly, any form of prior restraint on speech must be viewed with the greatest amount of circumspection because if any restraint effectively works as prohibiting speech, it is a grave danger to democracy. Secondly, we must allow a culture where a diversity of opinions prevail many of which may appear to be contrary to what most of the society accepts as the prevailing norm of the day. You must therefore allow a spectrum of views in the democratic base to prevail at any given point of time, which is one of the reasons for one of my dissents in the area. Thirdly, I believe that we must allow this to proliferate in the widest possible media of communication, which could be through art, literature, celluloid, music or through any such media of communication with which we live. Free speech wouldn't really have so much power if we don't recognise all the media through which speech can be conveyed. To have speech which is free, we must have a media which is also free and therefore I feel that the best form of regulation is the regulation which is left to the speaker himself or herself. Conscious as I am, that there is a doubt on a thing called 'absolute freedom' since even freedom of view is coloured by ideologies, certain interests at stake, but so be it, because I feel that democracy may pay the smaller price of a free exchange of ideas in order to preserve the idea or goal of a free society. S.B: In light of the Puttuswamy judgment, do you believe that the right to privacy judgment will hold strong in the years to come given that the majority of the world are already hooked to devices, are so used to giving away their information and the manic pace at which the world of internet changes? D.Y.C J: In the 1950s or the 1960s, the prevalent doctrine was that the state poses the greatest dangers to privacy and therefore the law of privacy evolved in that context. In today's age of the Internet, in the free flow of information, the state doesn't remain the sole actor whose behaviour of surveillance is an issue, because there are several other actors as well. In today's age we are already in the public realm, every aspect of our personal lives is becoming public. And as life becomes more and more efficient in terms of information technology (which is an amazing adjunct for an easier way of living), we're leaving more and more digital footprints almost every minute of the day. Even if I'm not using my smartphone, its positioning and location is still known to a third party. There are so many things about my personal life which are constantly being divulged by my smartphone. Even if I'm not actively using any of these products, the mere fact that they are in my possession or within my range or that I'm in their range or even in range of smartphones of individuals who are working with me, leaves me exposed to a third party. Somebody was telling me the other day that one can get to know about someone's personal life by just having a predomination of smartphones which are constantly detecting the presence of others who are related to that person. So even without using a smartphone, a conglomeration of other individuals and their information can tell someone so much about your life. I think that's a great challenge for the future because we must be very clear on the fact that there will be no going back on technology. If at all technology is to become even more efficient it will become even more intrusive. And therefore this is not going to be a battle but a work in progress because I don't think at any point of time we can say that we have arrived at a legal regime which will adequately protect privacy. You can only deal with problems of yesterday, I'm not sure if a legal regime will be able to deal with the problems of today because by the time you start dealing with today's problems in the legal regime, you're already in the tomorrow. It's a constant chase between the law and the dangers of technology. So the law must be that efficient that it can deal with the problems faced today or even the problems which are going to come in the future. But if we have independent regulatory control and make that adequately free from the interference by the larger and more organised sections of the society, I believe that could help us safely enter the future and help us tackle the dangers to our privacy. S.B: How would you advise the law students of today? D.Y.C J: How can I advise such bright young students, who are so much brighter than what I was in my days as a law student? S.B: You're being too modest, sir. D.Y.C J: No, I actually feel myself fortunate to be working with such a bright set of people who constantly enrich my knowledge, because you all have so much information and you read so extensively. S.B: How about a line of motivation? D.Y.C J: My line of motivation to all law students would be to read extensively because I think that is the window to the world. I would say travel extensively as I have traveled extensively, which has been the window to the opening of my soul to all the diverse ideas and notions which are so enriching of our society. The other thing I would say is that it is crucial that you have an open mind because having an open mind, especially for a law student is extremely important. It is through the openness of your mind that you allow yourself to continuously evolve, to be influenced by your friends, by your teachers, and you come in contact with your society in such public events. The greatest danger to an individual is a closed mind. And the final thing which I'd like to say is that never lose your sense of optimism because optimism about your future shouldn't end when you get your degree in hand and when you confront the problems of your day to day life. I think one must retain the optimism and hope for the future, and believe in ourselves, and in our ability to change the future of the things in our society. As I had said to you before, that element of compassion, of understanding of the position which others take even if you may not agree with them is again very crucial. Allow yourself to stand back and give yourself that little space. One of the dangers of today's age of information is that we don't get adequate space for ourselves and you're constantly being overwhelmed by information and knowledge. Stand back and give yourself that space, allow yourself that little time to reflect. That's the key to self-evolution I think. S.B: Who's your favourite cricketer? D.Y.C J: Presently, it would be Virat Kohli. In that past, it was Sunil Gavaskar and of course the eternal Sachin Tendulkar. There are other people as well on my list, people like Farokh Engineer who was such a dashing wicketkeeper and batsman we had in the 1970s. Those were my years of growing up and that's when you have more time for cricket, when you're younger. Then of course, Sir Gary Sobers, Sir Viv Richards who I was a complete fan of. Alan Border, Clive Lloyd, and you know, the whole range of those West Indies fast bowlers – Andy Roberts, Michael Holding, Joel Garner, Malcolm Marshall. Then there were other such legends such as Dennis Lillee and Jeff Thomson. These were guys who really set the game on fire, so to speak. S.B: What about music? I've heard that you were the occasional DJ in your St. Stephen's days and that you're a big fan of Bob Dylan. D.Y.C J: Yes! Music is something you associate with your generation but I try not to listen to only generational music. I feel very nostalgic when I hear ABBA now because they were quite big during my college days. I love Chris Martin and I love Coldplay! Fly On by Coldplay is my current favourite song. And my interns laugh at me when they hear me listen to Luis Fonsi's Despacito. S.B: You were in the United States in the 1980s. Were you drawn towards the rock and roll and heavy metal scene there? D.Y.C J: To be very honest, I was not one of those fans of heavy metal. I don't think that's my personality. I've always liked music which is a little softer and much of my choices of music have been softer. S.B: How does it feel to be a celebrity judge? How are you dealing with the fame? D.Y.C J: I don't agree with the concept of a 'celebrity judge'. What is it like to be a judge? I would say it's enormously satisfying. It's a wonderful experience because every day of your life you're learning so much. And it's a constant challenge to cope with the injustices of the society. Whether you're a celebrity or not, I think it's for the others to judge after you've laid down office. It's too early for my to say before the dust has settled on my judicial office. But I enjoy every day of my life as a judge and never felt that I would take any other post in life if I were given the option to do so. And, I would like to do the exact same thing again if I were given a chance. The interview was first published here.